WinTariff Call Accounting Software receives data from the office PBX about date/time of the phone call, duration, dialled number, etc. It stores data to the hard disk of the computer and uses it later in course of the processing. WinTariff Call Accounting Software builds up various reports - about all calls during the month, calls to a certain internal subscriber, etc. Based on data about the calls it is able to calculate various statistics data. ...... WinTariff Call Accounting Software stores data to the hard disk of the computer and uses it later in course of the processing. 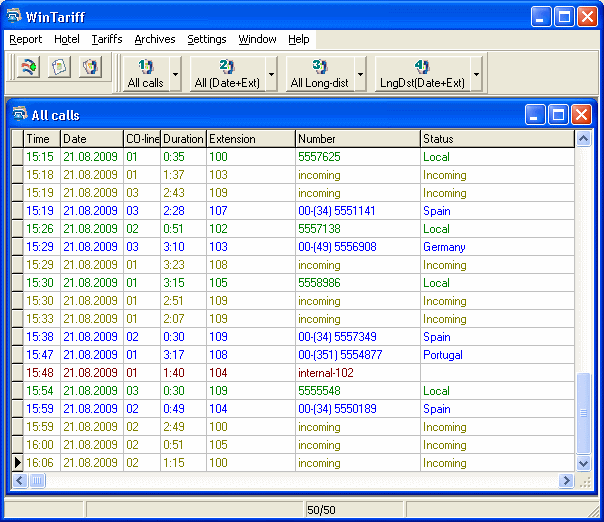 Based on duration and dialled number, WinTariff calculates cost of the call and determines the direction (in case of the long-distance calls a�� the city which has been called). WinTariff Call Accounting Software builds up various reports a�� about all calls during the month, calls to a certain internal subscriber, etc. Based on data about the calls the program is able to calculate various statistical data a�� this data allows the user to analyse usage of the resources of the office PBX and to improve operation of your office. Qweas is providing links to WinTariff Call Accounting Software 2.9.3 as a courtesy, and makes no representations regarding WinTariff Call Accounting Software or any other applications or any information related thereto. Any questions, complaints or claims regarding this application WinTariff Call Accounting Software 2.9.3 must be directed to the appropriate software vendor. You may click the publisher link of WinTariff Call Accounting Software on the top of this page to get more details about the vendor.